SoftChalk was demonstrating the latest additions to it's content authoring solution at the Educause Conference in Philadelphia last week. One new feature of particular interest is the support for curriculum standards. SoftChalk 7 now includes a standards "picker". User's can now select curriculum standards to associate with content. 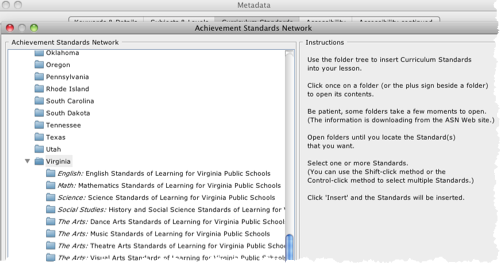 The list of standards and their descriptions are provided through an integration with the Achievement Standards Network, but there is also support to enter directly standards from other providers such as Academic Benchmarks or anyone else. Another great feature is that these standards can be assembled into a curriculum standards page that will automatically appear in the left-side navigation of your lesson. This generated page saves authors lots of time cutting and pasting standards' descriptions and gives lesson viewers one place to see all the standards in use. This effort continues SoftChalk's attention on two areas: leveraging standards, such as those from the IMS Global Learning Consortium and the K-12 market. The curriculum standards entered into a lesson will be available in an IMS Common Cartridge v1.2 package along with all other content. Curriculum standards such as the Common Core or state-specific sets are a key element in teaching and learning in K-12. Do you see these new curriculum features being helpful to you when developing content? Let us know your thoughts in the comments below.